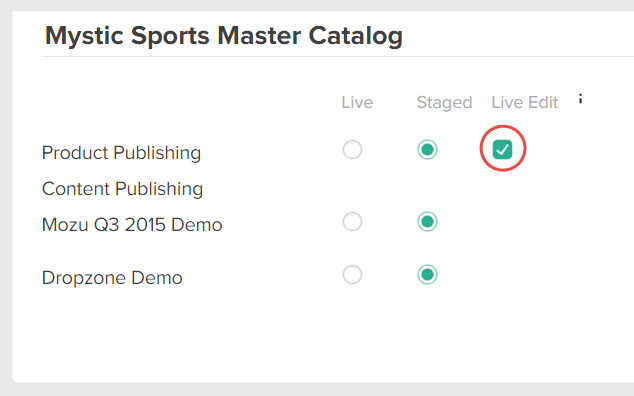 You can make immediate edits to products that are live on your storefront even if your product publishing setting is set to staged and you currently have pending draft changes for that product using the live editing feature of Kibo eCommerce. For example, you have a product live on your storefront, your product publishing setting is set to staged and you have a pending draft change for the same product. However, you notice that the price is incorrect for the product and needs to be updated immediately without going to a pending draft. You can use the live editing feature to edit the product price on your live storefront without affecting your pending draft change. You can currently only use the live editing feature with the Kibo eCommerce API. However, you must first enable it within Admin. Important: Live edits made to a product don&apos;t automatically apply to the pending drafts of a product. If you make a live edit to a product, you&apos;ll need to make the same edit to the pending draft of the product. Otherwise, if you make a live edit to a product without making the same edit to the pending draft, when you publish the pending draft your previous live edit gets overwritten. In Admin, go to System > Settings > Publishing. Ensure your product publishing setting is set to Staged. Check the Live Edit checkbox to enable live editing. The data view mode header, x-vol-dataview-mode, controls whether your edits are made to the product&apos;s live version or the pending draft version. The data view mode header can have a value of either pending or live. When the data view mode header is set to Live and you&apos;ve enabled live editing, your edits are made to the product&apos;s live version. When the data view mode header is set to Pending, your edits are made to the product&apos;s pending draft version. Set the data view mode header to Live. Make a Product Put request, such as UpdateProduct or UpdateProductInCatalog. New Indicates that the product has not yet been published and no live version exists. Draft Indicates that both a draft version and a live version of the product exist. Live Indicates that only a live version of the product exists. Editing a product&apos;s code always affects the live version of the product, regardless of the product publishing setting.